Facebook Lowers Page Reach After Boosting Posts: Myth Or Fact? Facebook Deliberately Lowers Your Page Reach After You Pay To Boost A Post. Fact or Fiction? The chances are high that you have a Facebook page to represent your photography business, and you post there often in an effort to promote your work and try to get more clients. If you’ve ever tried boosting posts from your Facebook page, you might have noticed a decline in the reach of your following posts, and it’s tempting to blame Facebook directly for that, or view them as some kind of evil corporation who only want to get more of your money. But is this perception actually true or false? By the way, if you only use your personal profile as your business presence, then you’re violating Facebook’s terms of service and you should go create yourself a page as soon as possible, or else run the real risk of having your account canceled. Anyway, I’m sure you’ve noticed that your page updates aren’t seen by as many people as you’d like, and it might feel a little discouraging to realize that Facebook isn’t showing your page updates to all of your fans. The number of fans who do see your normal updates, without the benefit of a paid ad or boost, is what we call your “organic reach”. In fact, depending on the type of update, the average organic reach of most Facebook page posts is around 5%. For example, at 5% reach, if you have 1,000 fans you could expect 50 of them to actually see any given update. Here’s a post from the Photography Business & Marketing Facebook page, which reached 11.4% of my fans organically (354 out of 3,100). Better than the average of 5%, but nothing to write home about either. An example of a Facebook page update, showing the organic (non-paid) reach of the post to the page fans. Why Is My Facebook Organic Reach So Low? Despite what many people seem to imagine, there is no conspiracy on behalf of Facebook to manipulate the newsfeed in order to coerce businesses into paying for ads. First, the amount of content being posted to Facebook each day is astronomical (frankly, how they manage to store and handle such enormous volumes of data boggles the mind). Second, Facebook is intended as a social network—not a marketing vehicle for businesses. People, including you and me, want to see posts in the newsfeed that are interesting and engaging, rather than a flood of updates from the businesses we happen to “like”. To that end, Facebook applies a complex set of calculations and rules to determine which of the many thousands of possible posts to show to any given user. Without this algorithm, our newsfeed would be more like an incoherent firehose. Updates from business pages are given lower weight in the algorithm simply because they tend to be more self-promotional in nature. This leads directly to a lower-than-expected organic reach for your posts, overall. Who Will See Your Facebook Page Updates Anyway? 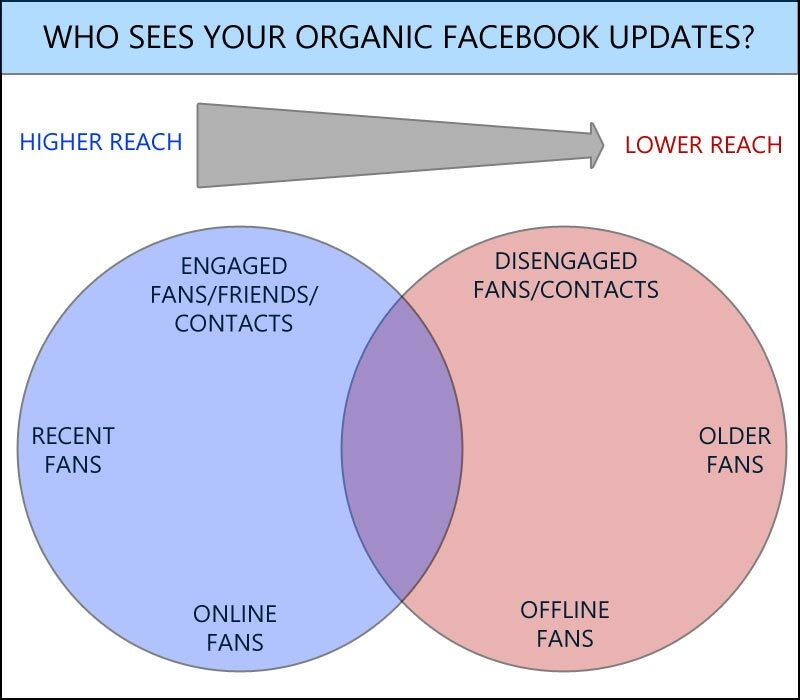 Who sees your organic facebook updates? This diagram gives you a visual idea of who sees your posts (blue) vs who doesn’t (red). This begs the question of who will see your Facebook page updates without any paid intervention? The diagram above gives an idea of who will be most likely to see your posts (the blue circle), compared to those who will probably miss it (the red circle). Fans who are already engaged with your previous page updates, together with fans who are also active friends or share participation in groups with you, will likely see your updates. People who recently liked your page might also see your next update as Facebook gives them a chance to interact with your content to get an idea of how engaged they’re likely to be with you—kind of like a honeymoon phase. Then you have those fans who happen to be online at the time your update is posted. These people may also see your update in their newsfeed, depending on the time of day and other content competing for their attention. The people who will most likely not be reached are basically the opposite of all those, although Facebook may decide to show your updates to some of those folks (probably later in the post life-cycle) in an attempt to re-engage them with your page. With such a low percentage of your fans seeing your updates, it’s tempting to click that little blue button that says “Boost Post” in an effort to reach a lot more people. And there’s nothing wrong with doing that, as long as you follow a few simple guidelines. Now, I’m not going to go into detail about the mechanics of how to boost a post, as there’s already plenty of information about that on Facebook itself, and things change so often that keeping this article up to date would be tricky after a year or so. The boost post panel in Facebook. Here is where you can set up an entire ad at once to boost a page update to more people. Once your ad is approved, let it run until completion. As long as your post was shown to the right people, you should see a good boost in engagement and likes etc. Often, you might find that your posts enjoyed a decent level of organic reach before you boosted your post, but your organic reach then dropped dramatically for newer updates after you chose to boost a post. I’ve seen some folks claim that organic reach dropped by as much as 90%. In one case, a photographer said hers went from an average reach of 600 to just 60. Definitely not insignificant, and a real nuisance. From there, and based on the superficial evidence, it’s easy to see why you might buy into the idea that Facebook now “have you by the wallet”, and have reduced your future reach because they know you’re willing to spend money on ads. Before we accuse Facebook of such evil underhandedness, it’s worth a bit of research to try to understand what’s actually happening. To understand this problem, recall the factors I mentioned earlier that go into the calculations Facebook uses to determine whether or not to show an update in someone’s newsfeed. 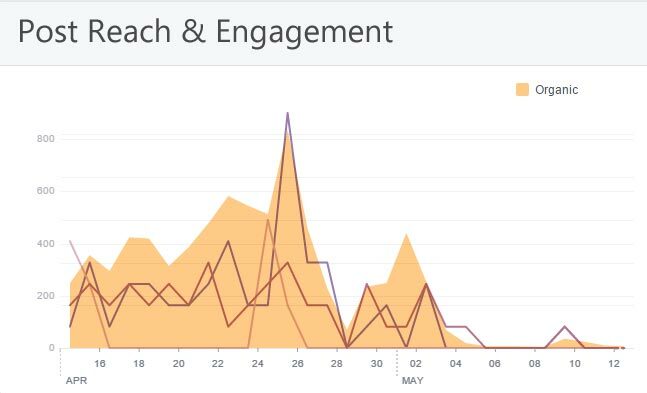 Here’s a graph taken from the insights on the Photography Business & Marketing Facebook page, where I’ve overlaid the engagement metrics with those for post reach. Post reach and engagement overlaid, to highlight the relationship between the two. As you can see, the average post reach appears to vary in sync with engagement, showing that there is indeed at least some relationship between these factors. Aside from things I mentioned above (and this is admittedly a very simplified look at what is, after all, a secret algorithm), there are also negative factors that may prevent your posts from being shown to more people. It’s these negative elements that contribute most to your lowered reach after boosting a post, not Facebook somehow manually reducing your reach. For example, let’s say your boosted post was shown to 500 people. If a portion of those people flagged your ad as irrelevant or uninteresting in their newsfeed, then that would count as a negative sentiment (an “anti-like”, as it were). And what if nobody bothered to comment, react, or share your post? This means you showed your content to a lot more people who then basically shrugged and walked away. This has the unfortunate knock-on effect of lowering your existing average engagement rate for your entire page. A lower average engagement rate then serves as a signal to Facebook that your page content may not be as useful or interesting to people, so they show less of your future content and more of someone else’s juggling cats videos or silly memes. You can see for yourself how your boosted post might be negatively impacting your reach by looking at the relevance score for your ad in the Facebook ad manager. Incidentally, this is why you don’t want to constantly chase after more page likes, except for people who are genuinely engaged with you and your photography. Adding more page likes might make you feel loved, but increasing the pool of disengaged fans only serves to lower your organic reach even more! You know by now what effect that will have, right? If you’ve been unfortunate enough to suffer the effects I’ve outlined here, what can you do to recover? Since we can safely say that Facebook aren’t acting like evil Internet demigods by manipulating their own algorithm, we can assume that traditional social media marketing tactics will be effective in solving the problem. You could, for example, feature specific fans, or start posting a series of images, tips, or inspirational quotes, over the course of a few days, just to get things kick-started again. Don’t worry if there’s no immediate response, just keep going, and you’ll start to see signs of life again. However, it’s important to reward your fans in some way if they interact with your content because you can easily lose them again! At the very least you should acknowledge all “likes” and comments, but I’m sure you get the idea. A slightly more advanced tactic would be to use strategic posts to “seed” the engagement level on your photography Facebook page. Let’s say you plan to offer a portrait special in a few days or a week’s time, and you want to maximize the number of people who see the offer when it comes out. What you can do is plan a series of posts in advance, designed to increase the level of engagement on the page, in preparation for the main event—kind of like a warm-up act. I’ve used this tactic myself in the past to good effect, so I can definitely attest to its effectiveness. The success of this type of approach depends a lot on forward thinking and planning, so bear that in mind for future promotions. 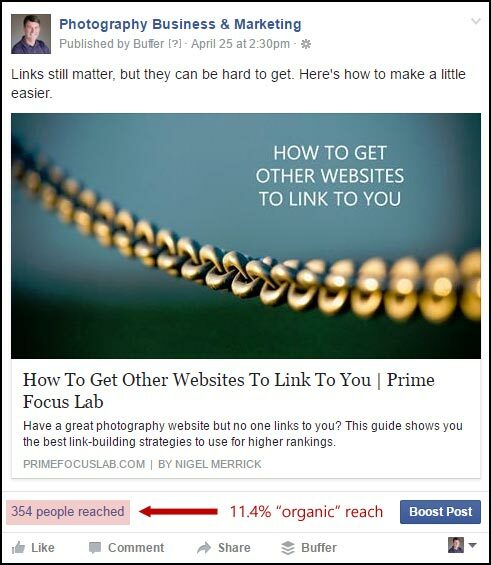 At the end of the day, recovering your organic reach can take some time, and you might need to try several tactics to get the results you want. The last thing I want to mention is that you can avoid a lot of these problems by not actually boosting posts, but using regular photography Facebook ads instead. This is the best course of action to take if your existing Facebook post doesn’t already have a decent level of engagement. After all, boosting it will only amplify the effect you’re already seeing, and a reduction of organic reach will be sure to follow. 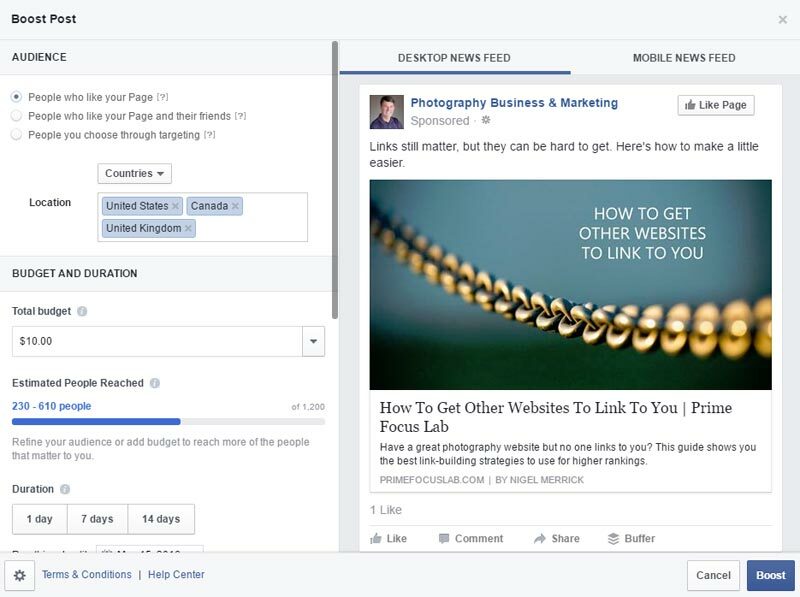 If the Facebook update you want to boost is for a blog post or article on your website, consider using the Facebook Power Editor or ad manager to create a standalone ad for your post instead. As far as I know (and this could change, of course), the resulting engagement on your standalone ad is not going to affect the reach of your regular page updates. 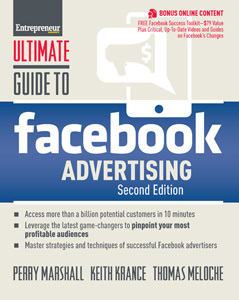 Perry Marshall, author of the #1 selling book on Google AdWords, joined by Facebook Advertising specialists Keith Krance and Thomas Meloche, lift the curtain to the more than a billion potential customers, by marketing on Facebook. This Facebook Guide will bring you more Facebook Fans quickly and reliably. You’ll discover how to pinpoint your most profitable audiences—then, how to reach them, convert them, and keep them as your Facebook fan, friend, and customer for life.